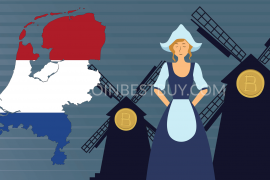 Home » Countries » Where to Buy Bitcoin in Belgium? Can You Sell BTC in Belgium? This article will describe various ways of buying bitcoins for Belgians or people who live in the Kingdom of Belgium. Each of them has its own capabilities, pros and cons, fee structure and various supported currencies. Read more and find an exchange that will become your favorite. 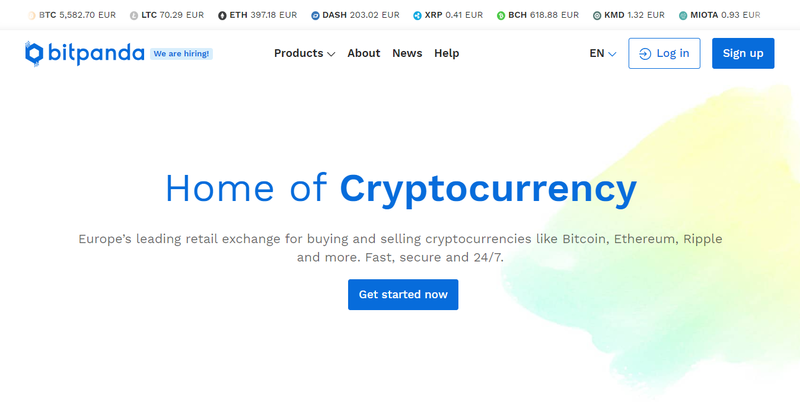 Go to the exchange’s website of your choice and make an account to start the purchase process (Kraken in our case). Complete two tiers of verification by clicking “Account”, then “Get Verified” and filling out personal information. Should you wish higher limits, you can repeat the process and add a scanned ID to the account. Click “Funding” and provide your bank details, as well as the amount of USD/EUR you wish to deposit. Once your balance is filled with necessary funds, go to “Trade” tab and fill out the order form. 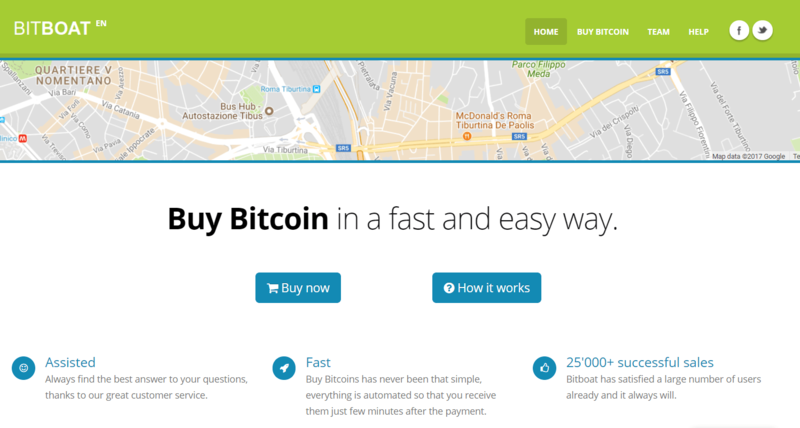 Click “Buy XBT with EUR/USD” once you have everything set to get coins instantly. For withdrawals, go back to your “Account” and then click “Withdraw” to transfer bitcoins out of the exchange. 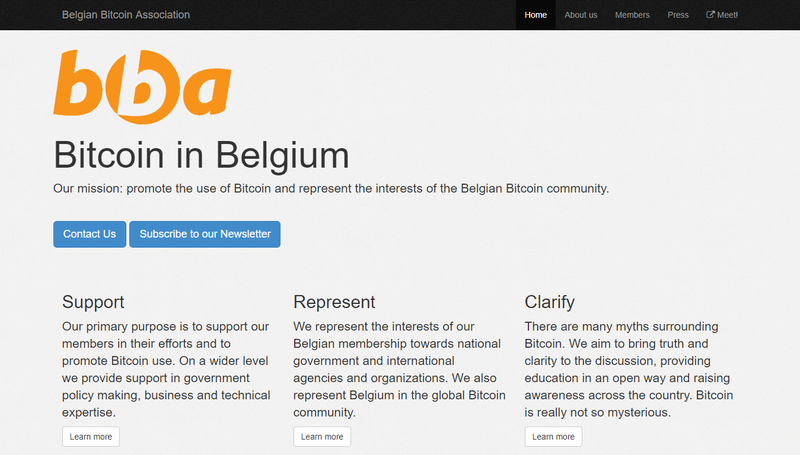 Is BTC Regulated in Belgium? Can I Use Paxful to Get Coins? How Many Bitcoin ATMs Are There in Belgium? Can I Possibly Sell Coins? 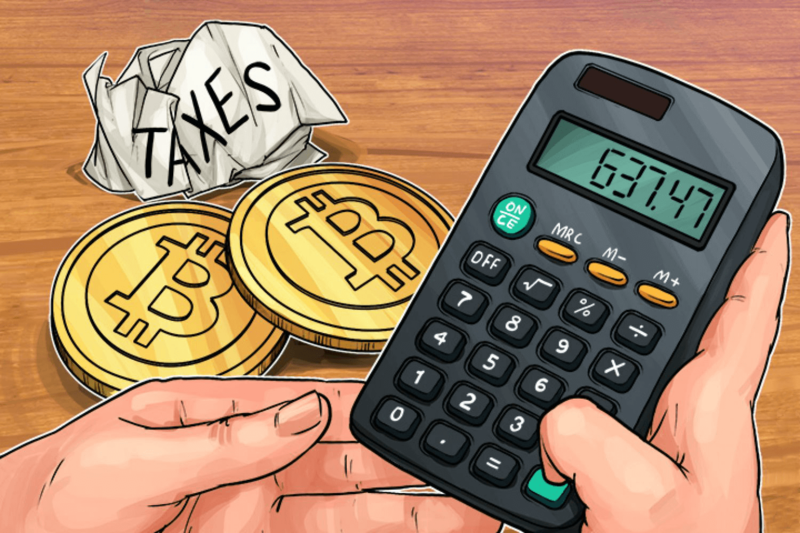 Are There Tax Implications for BTC Trade? How to Safe Keep My Coins? Bitcoin has traveled a long road since its establishment in 2009 to become what it is today – a leading cryptocurrency with over a billion worth in US dollars. Right now, many platforms exist that provide exchange services for traders that are interested to invest in the coin. 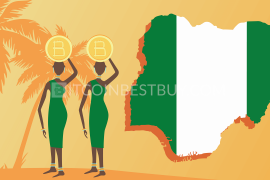 This quick guide investigates one of those countries that are known to be a safe haven for the BTC, Belgium. 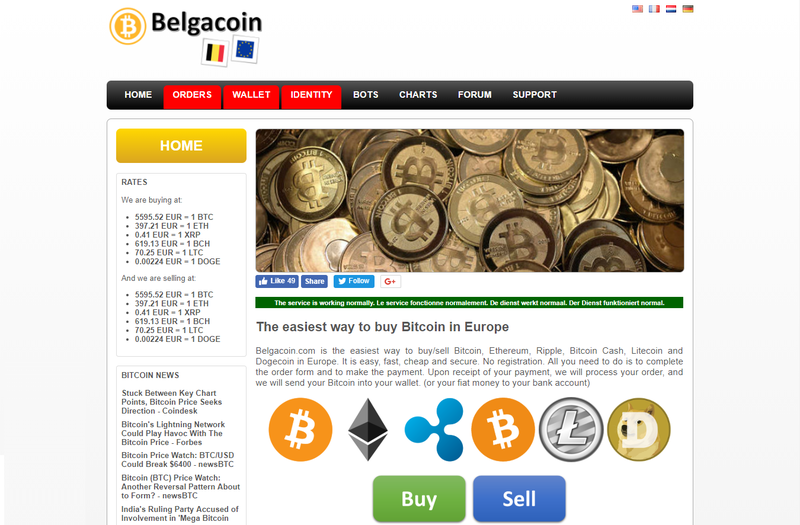 This buy bitcoin Belgium review aims to provide an answer on how and where to get BTC. We go over many exchanges in terms of their fee structure, verification policies, available payment methods, accepted fiat currencies and other factors that you, as a trader, should be aware of. Bitcoin is a regulated asset in Belgium, which follows the EU example closely when it comes to cryptocurrencies on the whole. The governmental agencies have deemed the digital money as an online commodity, and not as a legal tender, like EUR. You are thus expected to pay taxes and compile business reports should you wish to trade bitcoins. 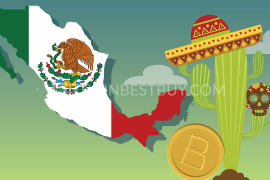 Exchanges operating within the nation’s borders are also expected to comply with the general business rules, thus firing companies to follow strict KYC and AML policies. In this guide, we go over safe platforms only to ensure you have an opportunity to get your coins without a fear of being tricked. We compiled pros and cons analysis for each exchange, as to provide you with necessary knowledge when choosing your source of bitcoins. Belgacoin is one of those rare exchanges that have headquarters in Belgium. The platform dubs itself as one of the easiest channels for bitcoin purchase, since you do not need to register an account with the exchange in order to buy coins. This also means no verification process or identity checks needed. Currently, only wire and SEPA transfers are accepted as means of payment while currencies available to you are numerous, including EUR. Fees are set to be 1.5% of the overall trade value. a large number of fiats. 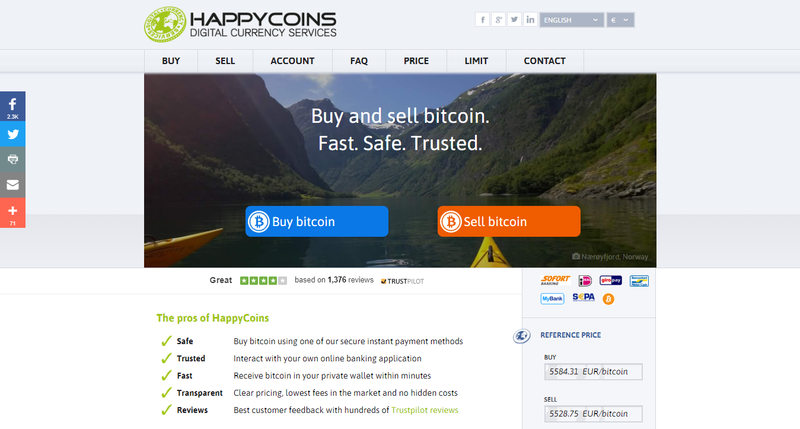 HappyCoins offers a peculiar registration process, since you do not really create an account. You provide your email and receive an ID number, which is used to purchase coins with. Accepted payment methods are SOFORT, SEPA, iDEAL, Giropay and bank transfers, while the only fiat money of trade is EUR. Be warned that fees are not shown transparently, only after you have filled out the order, which ranges across the payment options. You do not need to verify your ID in order to get BTC at this platform. several options available when it comes to payment channels. Since 2012, this UK-based exchange has strived to provide the best bitcoin purchase series in Europe. Accepted payment methods are SWIFT and SEPA, both of which are bank transfers. In order to use these, full verification is expected of respective clients. You also have a fee structure that depends on your monthly volume ranging from 0.1% to 0.3%. You do need to provide scanned personal documents in order to participate in the market, while accepted fiats are GBP, EUR, PLN and USD. good liquidity and supply level. apart from bank accounts, no other payment channels available. 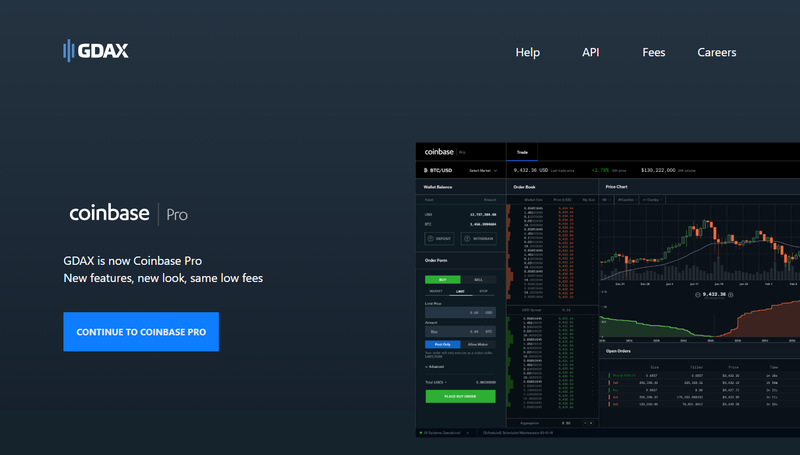 Kraken is one of the leading EUR-oriented crypto platforms, where you can use both simple exchange and margin trading services. 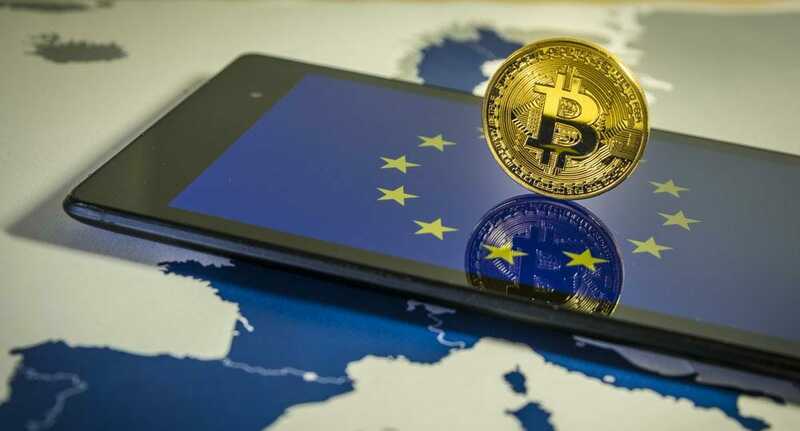 It is also one of the biggest EUR to BTC trade centers, offering several cryptos for trading purposes. Deposit limits and withdrawals depend on verification level achieved, with only personal details bringing you $2,000 daily limit. With this exchange, you can purchase coins using bank transfers only while fees range from 0% to 0.26%, depending on maker/taker order form and achieved a monthly value of the trade. both exchange and margin trading available for clients to use. verification of your details can take quite a long time. Paymium is one of the very first licensed exchanges in Europe, having its operations established in 2011. The company offers several payment methods that are all expressed in EUR, them being credit cards and SEPA transfers. Bank cards have a really high fee rate of 8% while SEPA (free) is meant for those traders that are looking for cost-effective trading. In order to pass €2,500 mark, you would need to provide your scanned ID and utility bill as part of the verification process. SEPA transfers available without any additional costs. verification would be needed after the €2,500 mark. Much like Paymium, Safello also offers SEPA bank transfers and credit cards for Belgium traders. The exchange does not support its own wallet, but sends coins directly to your external storage platform, which is a plus on the security side. On the downside, fees are not shown directly while buying bitcoins, but are part of its price. Since trust is needed, platform accepts only fully verified accounts to use its services. credit card purchases available in EUR. not a private way to get coins due to KYC document demands. Coinhouse is a French firm that offers many similar services like other European platforms. You have bank transfers (SEPA in particular) and credit cards as funding channels. In order to trade at this website, you are required to pass through identity check process, which requires ID and proof of address from its clients. Fees are set to be the same no matter the chosen payment method and stand at 4.9% + €9.90 for buying online. credit cards speed up purchase process considerably. bank transfers also hold a fee of 4.9%, which is a lot higher than the industry average. Mycelium is a platform that started out as a wallet and vault service provider. 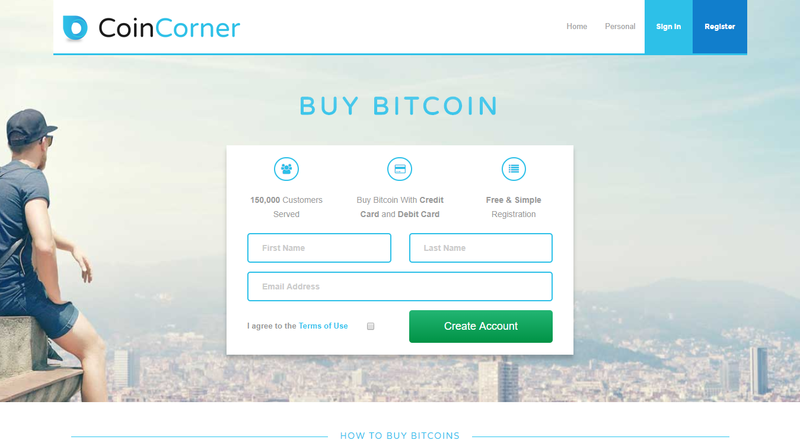 Later on, it also added its own P2P platform, where users and trade bitcoins between each other as well. The exchange works much like LocalBitcoins or Paxful, as you swift through different offers in the market and chooses the best suiting one according to your preferences. Trade fees stand at 1% while verification is left for individuals to decide, which can be viewed as a double-edged sword. Unverified accounts are very risky to work with after all. provides a possibility to privately get coins. scams are quite possibly due to the light verification requirements. 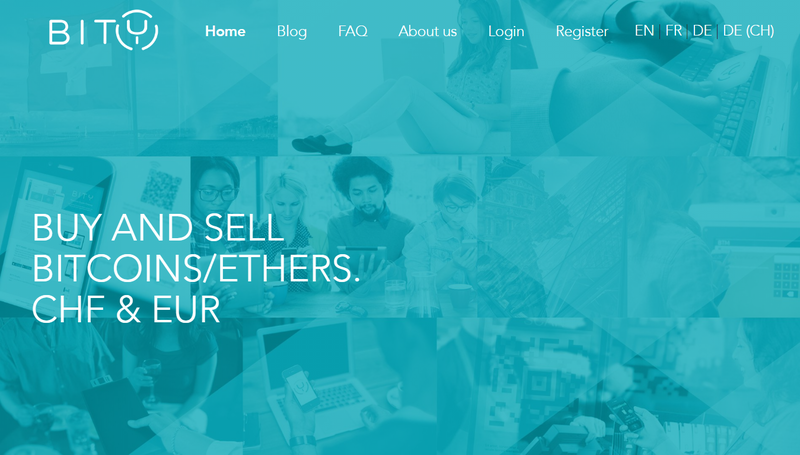 Paxful, alongside with LocalBitcoins, is one of the most popular bitcoin P2P marketplace around the globe. The company offers over 300 payment method and currencies at your disposal, meaning both SPA and EUR transactions are supported. Verification depends on what sellers look for, and fees stand at 1% for sellers only. It should be noted that individual ads usually hold a small batch of coins ready for sale, while identity checks are made by providing your scanned ID to sellers directly. privacy can be achieved through a seller that does not require your ID. usually small amount of coins available on individual ads. Bitfinex, even after the hacking incident in 2016 still holds the first place in the world in terms of USD to BTC trade volume, which is surpassing $1.1 billion on daily basis. The platform implemented a large set of security features after the issue with lost funds and is now actively participating in improving the user’s experience and safety. Only bank transfers are accepted, while there are over 30 cryptos available for trade. As for fees, they are organized in a maker & taker structure, ranging from 0% to 0.2% while deposits stand at 0.1% for wire transfers. sophisticated margin trading and analysis tools. verification is needed should you wish to buy BTC from Bitfinex. GDAX (Global Digital Asset Exchange) was established in 2016 as a subsidiary of Coinbase, with the aim to provide margin trading platform, that Coinbase lacked at the time. Now, it enjoys supply from the Coinbase and good customer number size. It also operates in 32 countries only, with Belgium included in its platform. Bank transfer is the only accepted deposit mean for fiats, while fees stand between 0% and 0.3%, depending on the monthly volume achieved and whether your order is a maker or a taker. low fees when compared to peers that accept fiat deposits. bank transfers are the only channel of funding. 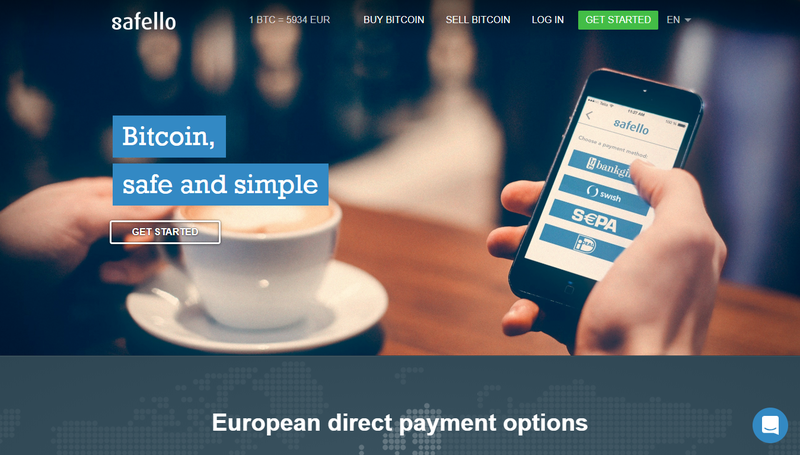 CoinCorner takes a step ahead of other European exchanges and offers NETELLER, as well as bank transfers and credit cards as means of payment, much like Bitit. You have an admin fee of 2.5% while the minimum deposit expense would be $10, no matter the option chosen. Accepted fiats in this platform are GBP and EUR, becoming available to you only after you finish up extensive verification of your identity. credit cards hold a cost of 2.5% only. USD not available as a fiat currency. Bitit is a French company that offers an online exchange platform for crypto traders to use when buying bitcoins. Available payment methods include credit cards, cash vouchers and banking (TrustPay). Fees range from payment option to another, with credit cards being changed additional 6.9%, vouchers from 5.9% to 11.9% while bank account transfers hold 3% costs. You do need to verify your account should you wish to get BTC using the Bitit platform. 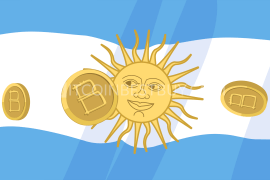 The firm also accepts numerous fiat currencies, EUR included. fairly instant access to coins within Bitit. cash vouchers available online in-store, which are located only in Paris. 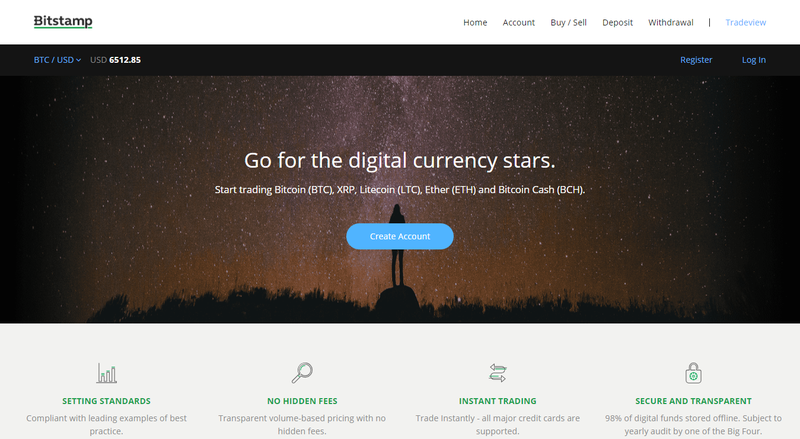 Bitstamp is a Slovenian company dedicated to providing cryptocurrency exchange services. 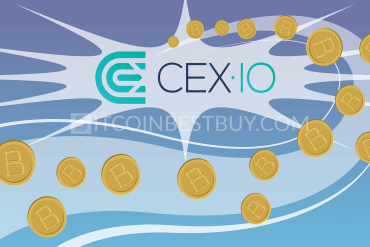 Operating since 2011, the exchange offers typical services for crypto exchange platform, where you can fund your account with the help of bank transfers (SEPA), credit or debit cards and international wire deposits. You need to pay up fees according to what your order is (maker or taker), with costs ranging from 0.1% to 0.25%, depending on your achieved monthly BTC volume. Credit cards hold a 5% fee, SEPA is conducted for free while wire USD transfer carries a 0.05% expense. Verification of your identity is necessary for trade to take place. 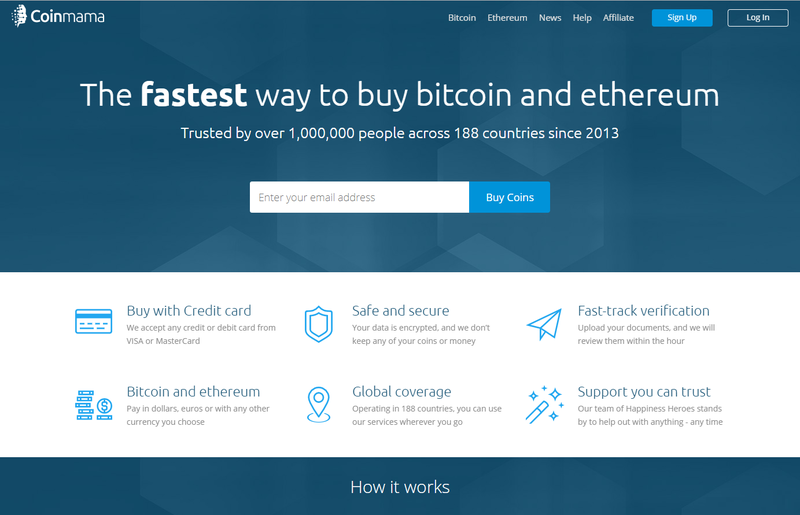 instant access to BTC with EUR credit cards. 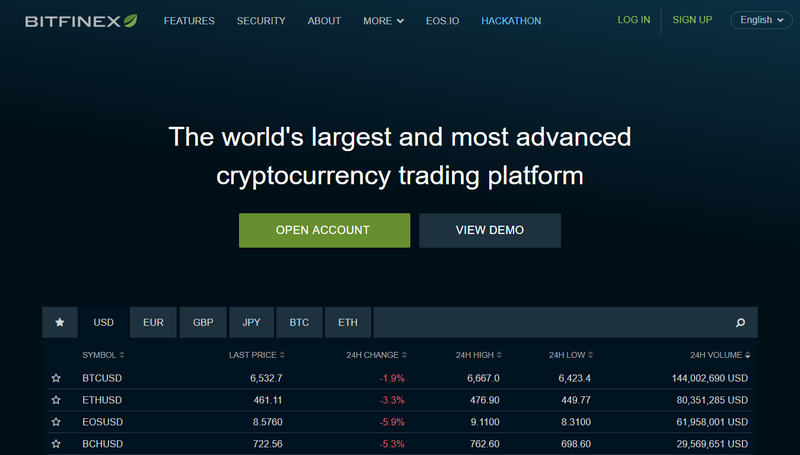 the exchange was hacked during 2017. 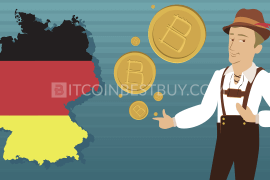 Bitcoin.de is a German-based exchange that offers a standard P2P marketplace for traders looking for a variety in bitcoin supply. 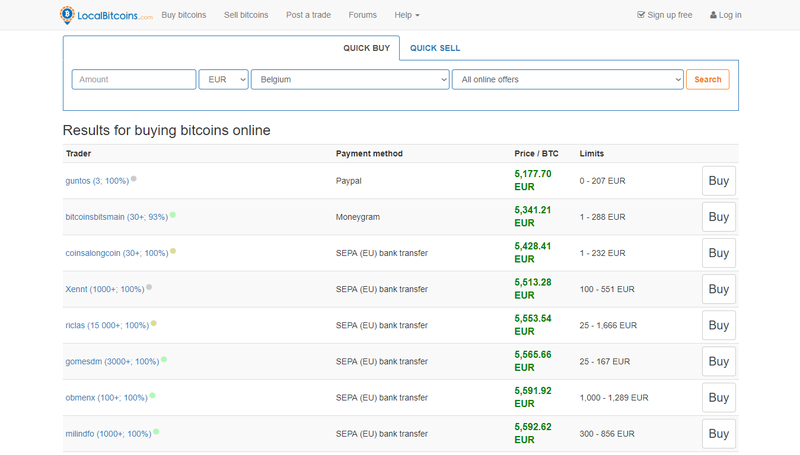 The main payment method in this platform is bank transfers, with SEPA available for Belgium traders. Fees are divided between buyers and sellers, standing at 1% for SEPA transfers. For security reasons, all participants in the market are required to verify their identity with personal documents. secure market, since only verified accounts are permitted to trade. other than bank account deposits, there are no other payment methods. 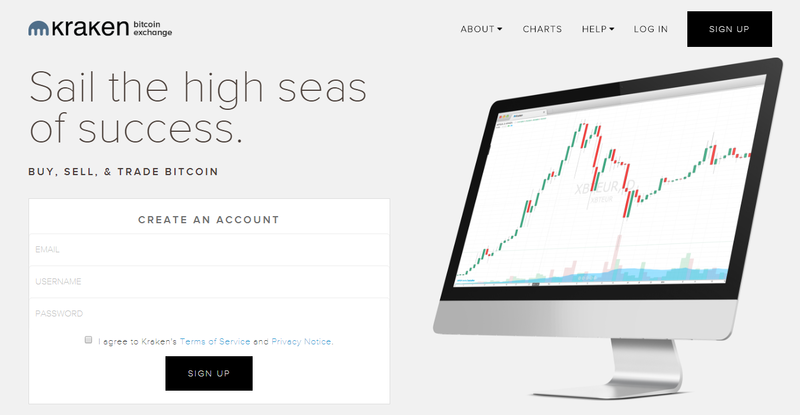 Bitboat is a UK firm that offers cryptocurrency exchange services for European customers. The platform offers a paysafecard voucher and Neosurf cash voucher as means of payment is does not make its clients register their accounts. 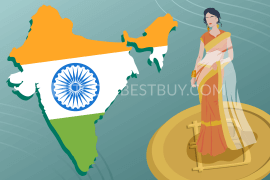 This means, it is quite a private exchange to use should you opt for cash purchase. On the downside, fees are not shown transparently, and purchase limits are quite low for paysafecard. You have €200 daily and €5.000 monthly limit for it, while Neosurf has €5.000 monthly limitation. low volume available for trade. 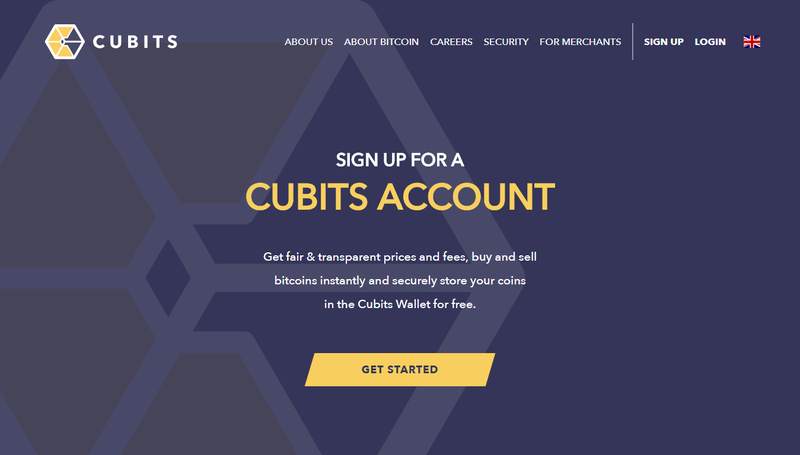 Cubits are one of those platforms where you have an abundance of fiat currencies, including EUR. Currently, you can trade with over 20 fiats, using purchase methods like a credit card, Rapid Transfer, SOFORT, OKPay, Dotpay and SEPA transfers. Fees can be seen as average in industry terms, with credit cards having 5% + €5 costs and bank transfers being conducted for free. You also have to account for 0.9% of trade expenses when converting EUR to BTC. some purchase options carry a large expense. If you are looking for a way to use PayPal account when buying BTC, VirWoX should be one of those platforms within your radar. 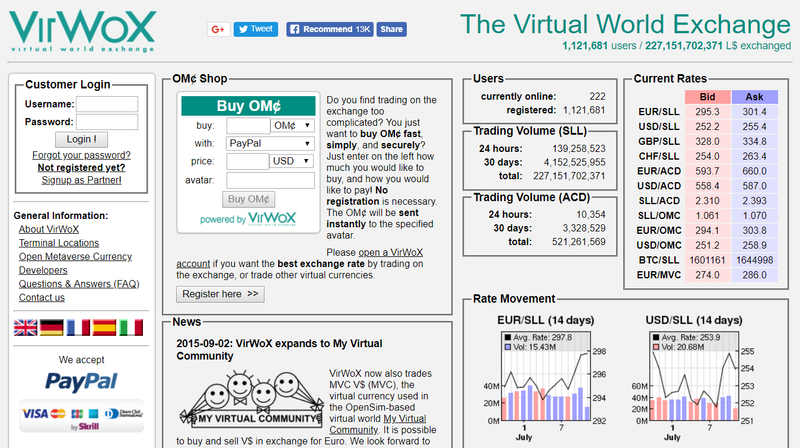 The exchange primarily works with a currency called Second Life Lindens (SLLS) used in a virtual world called Second Life. 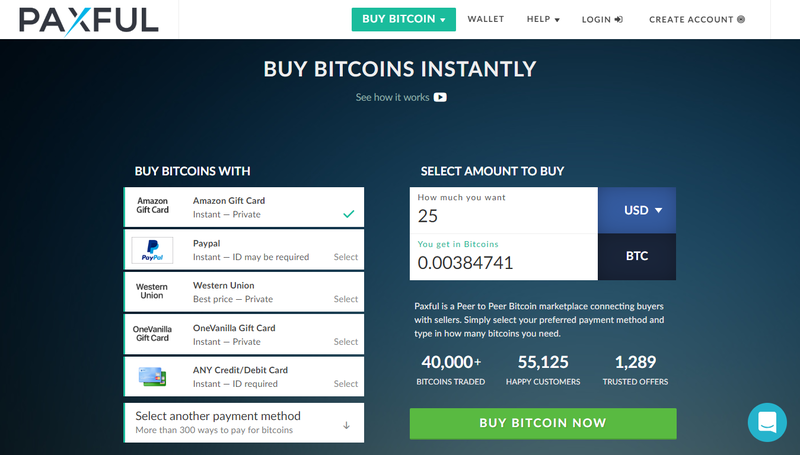 It allows an indirect way of getting bitcoins, as you cannot purchase them straight out. You have to deposit money first, trade fiat for SLLs, and then SLLs to BTC at the end. The entire process thus brings 10% of fees as each step is charged. Accepted payment methods are credit cards, PayPal, SOFORT, OKPay, paysafecard and Skrill, while supported by fiat money is EUR, CHF, GBP and USD. large fees due to the exchange charging each of the three purchase steps. Bitcoin Belgium is a news platform from which you cannot direct buy bitcoins, but rather find useful information and latest development. It is important to check its content from time to time, since the team behind the website works around the clock to bring you fresh news and trends from the market. The community also provides links for safe exchanges that operate within Belgium’s borders, while traders can communicate directly with each other using the platform’s communication tools. 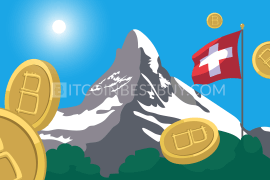 This Swiss company offers bitcoins with the help of bank transfers, while accepted options within this range are SEPA, SOFORT and online banking services. Although the company has its own ATM network, all of these machines are located in Switzerland only. As for the fees, SOFORT and OBT channels are the only ones carrying any sort of costs, them being 0.9% + €0.25 and 2% + €0.15 respectively. instant banking purchase processes available for use. unverified accounts cannot use services from the company. Although the platform is based in Indonesia, its services are available worldwide, meaning that payments made from Belgium are also supported. Traders should account for conversion costs due to the fact that only INR are accepted as funding money. Fees, on the other hand, are quite low, ranging from 0% to 1.0% depending on whether your order is considered to be a maker or a taker. You would also need to upload your personal documents should you choose this platform as a base of your BTC trading operations. deep liquidity and adequate daily supply of bitcoins. verification needs to be completed with personal documents. Coinmama is one of those exchanges that value both speeds and security of your funds. Thus, it works only with credit cards and verified accounts. You do need to provide your scanned ID and proof of address as BTCs are sent directly to your external wallet. Coinmama itself does not provide wallet services for its customers. The credit card purchase at Coinmama comes with a 5% fee, which is slightly higher than what industry’s average is (Coinbase, for example, charges 3.99%). Accepted fiat currencies are USD and EUR. coins are sent directly to your wallet, rather than kept at the exchange. limited scope of payment options as only bank cards work. LocalBitcoins is perhaps the most well-known P2P platform for bitcoin trade in the world. Depending on the number of traders, the supply can be quite sufficient for buyers originating from Belgium. You have an abundance of choices when it comes to fiat currencies and payment methods available. The platform offers escrow services to ensure the safety of your finds while trade fees stand at 1%, paid by both buyers and sellers. Verification is left to individuals to decide upon, meaning you do have a chance to purchase coins completely privately if there is a willing seller. with right seller, privacy can be ensured. usually small amount of bitcoins available per ad. 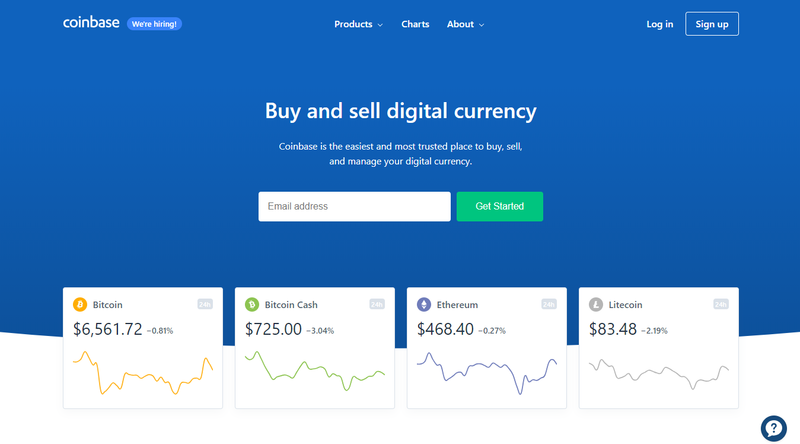 Coinbase is one of the largest cryptocurrency exchanges in the world, offering its services to 32 countries, Belgium included. You can get coins through this platform with the help of credit card and bank transfers, while PayPal is available as a withdrawal option. Both USD and EUR are accepted as means of funding while fees stand at 1.49% for bank transfers, 0% for SEPA and 3.99% for credit cards. To buy bitcoin at Coinbase, full verification of your identity is necessary, thus the platform is not considered to be private. PayPal available as a fiat withdrawal option. it has been noted in the past that exchange might rack down your activities within its website. 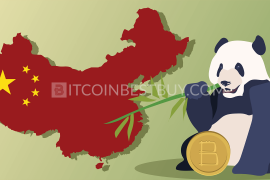 BitPanda is an Austrian-based business, dedicated to becoming a leading European bitcoin broker. Moreover, it also competes s in several other crypto platforms, such as Ethereum, Litecoin, Dash, Bitcoin Cash and Ripple. 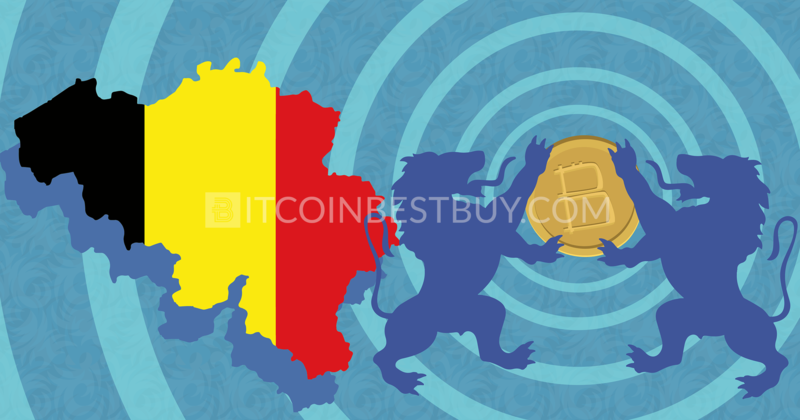 Belgium traders have the ability to fund their accounts with the help of numerous payment methods, them being credit cards, wire transfers, SEPA, SOFORT, Skrill, NETELLER, cash vouchers and Giropay. Unfortunately, fees are not shown transparently, but as a regular price of the crypto. The volume changes according to the payment method used while the only fiat accepted in this platform is EUR. several other altcoins accepted as well. verification needs to be completed for higher-end purchase limitations. 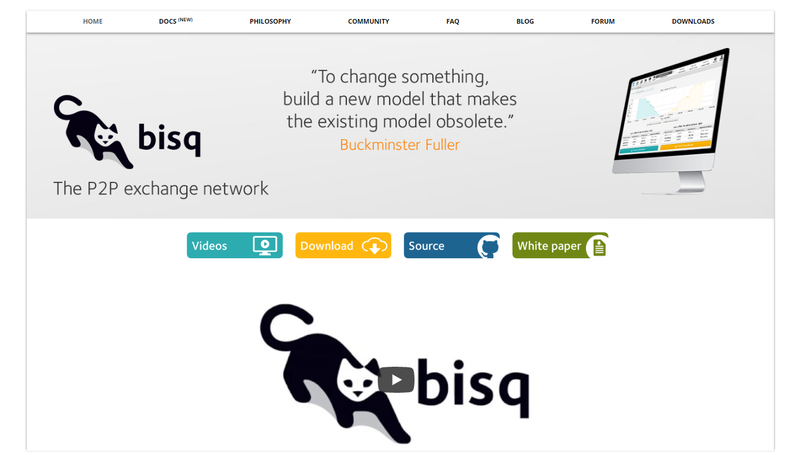 Bisq, formerly known as BitSquare, offers a unique service and marketplace for its clients. It does not exist on web browser since you need to download the software and install it on your computer. The fee structure is not implemented, meaning you can trade with quite competitive prices for your bitcoins. It is completely private to use, as identity verification not asked of you at any point in time. You do need to deposit funds into the marketplace in order to successfully trade. many payment methods accepted as legitimate within the platform. marketplace lacks the support that LocalBitcoins and Paxful enjoy. 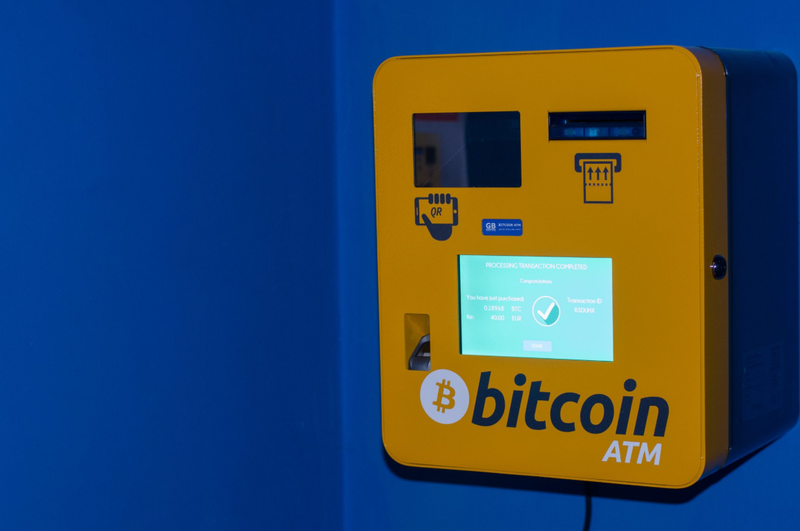 ATMs dedicated for bitcoin trade pose a great way to purchase coins anonymously and instantly. There are 6 confirmed locations within Belgium, equally spread around the county. It is important to note that these locations are all urban, with many potential traders living quite far away from them. Additionally, fees range from 5% and above, while service hours might not always represent the real situation. Most ATMs accept credit cards and cash deposits while transaction itself takes about 5 minutes to be completed. can be a completely anonymous way to purchase bitcoins. quite high fees when compared to other methods. 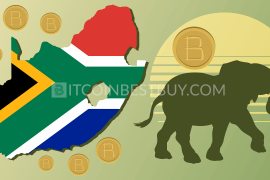 In most exchanges mentioned in this guide, you can sell BTC as easily as purchasing them. Much the same pros and cons apply to this process, as selling and buying coins come with rules regarding verification requirements and fees. Make sure you work with an exchange that suits your needs, in terms of available fiats, withdrawal methods and security of your personal details. When it comes to taxes, Belgium traders are expected to pay up a rate of 33% of tax on their gains, should fiat currencies be involved in the process. Although not considered as a legal tender, bitcoin and other cryptocurrencies are still seen as online assets that can bring profit margin back to the respective investors. The agency responsible for the tax policy implantation in Belgium, Special Tax Inspectorate (STI), is still in the process of creating a legislative system for cryptos but for now, BTC is viewed to be part of the “Other Income” entry in the section of the tax return. When it comes to assets’ security, nothing really beats hardware USB wallets. These devices offer superior security features than other storage capacities, be it online or desktop wallets. These products come with private key generation, PIN codes and even physical buttons used to make transaction confirmations. Moreover, manufacturers do not hold any sort of information about your device except for its ownership, allowing you to use the HD wallet in offline mode as well. 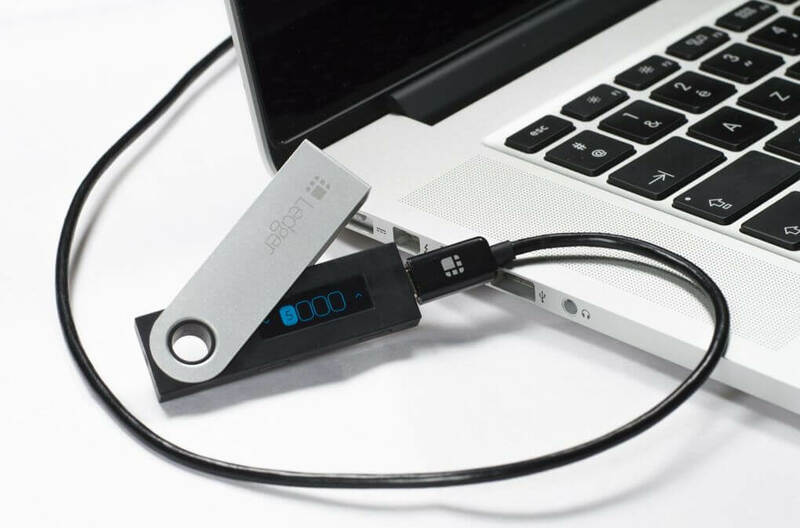 The most famous examples are Ledger Nano S, TREZOR and KeepKey. Each of these products, although similar in scope of services they provide, has its own set of pros and cons. Should you encounter a problem that has not been specifically covered by this guide, make sure you reach us at BitcoinBestBuy and get the latest information regarding your issue.